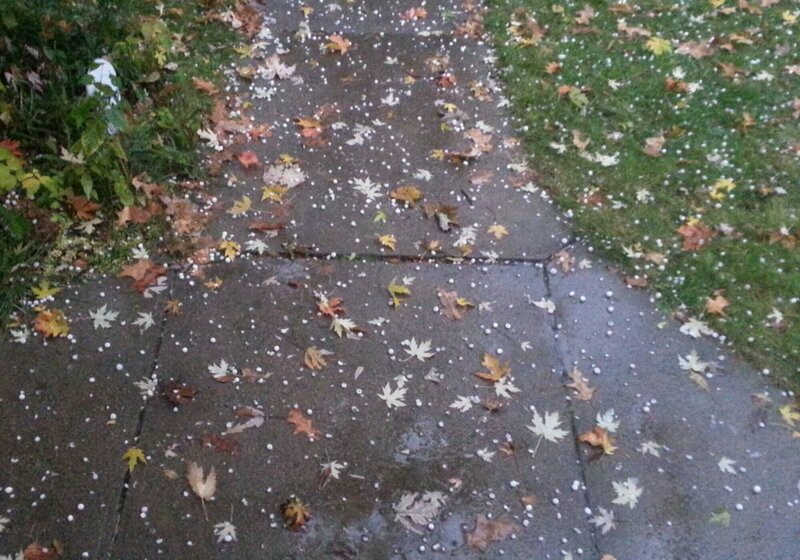 I heard the rapping of hail stones shortly after they started this morning. It was quiet and dark in the warmth of my home. The light outside had just started to lighten to an eerie gray, where the light is not full but it transcends the dark. I could see the small yellow leaves falling as the rain and hail pounded their fragile stems loose from the branches. I chose not to continue working but to grab my camera and see where this storm would take me from the vantage point of my covered front porch. I noticed three things as I sat watching hail stone after hail stone roll and bounce. One, aside from the rush of the rain all I could hear were the small ice spheres hitting the roof, street, my car and the sidewalk. Two, my roofs pitch made a perfect launching ramp for those hail stones to hit my little car. Lastly, as I sat, I noticed how calm I felt enjoying another show from nature. I am glad I took the few minutes to look and listen. Sometimes it only takes a few minutes to recenter and enjoy the calm. In all my travels coming home always feels…right. I love knowing that this little place is my home, where the dust settles, the lawn grows, and my little personal keepsakes are scattered. It is cozy in the winter, vibrant in the spring, relaxing in the summer and earthy in the fall. It isn’t a mansion or a king’s palace but it is home. And although I love to “come home” the adventures outside my door intrigue me so that once again I am off exploring! No matter how small you are you can still be spectacular!